The word Sapphire is derived from the Greek word "sappheiros" which means "precious stone". For those who were born in the month of September the Sapphire is the traditional birthstone. The properties with which the Sapphire is associated are truth, sincerity and constancy. The Traditional Metaphysical Properties for the September Birthstone Sapphire are clairvoyance, insight and interpretation. The healing properties of the September birthstone are reputed to be effective for health problems relating to lowering fevers and inflammation, hearing problems, cancer and burns. The Sapphire is also said to enhance the influences of Venus and and banish evil thoughts. Sapphires are the blue transparent variety of corundum, highly prized as a gem. The Sapphire is a member of the Corundum (aluminium oxide) family. Crystal structure of the Sapphire, the September birthstone, is hexagonal (trigonal), dipyramidal. Sapphires can be found in a variety of colours, not just different shades of blue, these include yellow, pink and white. Sapphires with colours other than blue are generally referred to as fancy sapphires. The distinctive blue of the sapphire is due to minute amounts of oxide of iron and titanium in the stone. One of the four precious gemstones. The other three are diamonds, rubies, and emeralds. 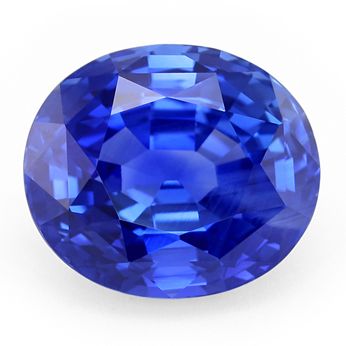 Sapphires are found in Sri Lanka, Thailand, Cambodia, Burma, Kasmir, Australia, Nigeria, Kenya, Tanzania, China and the U.S. The symbolic meaning of the colour blue has a Biblical meaning symbolizing heavenly grace.